Alpacosplay is an avid gamer, artist, and cosplayer. She began cosplaying over ten years ago at her first convention. 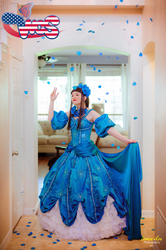 In 2013, she started competing in cosplay contests and despite numerous attempts by her sewing machine to eat her hands, hair, and soul, she won several awards for craftsmanship and performance. Most recently, with her cosplay partner Yummy Gamorah, she over came a crippling addiction to cute pincushions for the honor of representing the United States at the World Cosplay Summit in Nagoya, Japan for 2015. They competed with 26 other countries, winning the Brother Award for best costume and 3rd place overall. Alpacosplay loves alpacas and would love one to be her best friend and maybe form a mystery-solving team with her. She likes to play with swords and other things that would probably injure her without granting her any super powers. And if you have a melon soda, she wants it, like, right now please, thank you.